Nancy Gifford: Bio & Choral Music | Santa Barbara Music Publishing, Inc.
Nancy Reale Gifford graduated with honors from Rutgers University, New Brunswick, New Jersey with a Bachelor of Arts degree in Music. Her concentration was Piano Performance, and she received certification to teach Music K-12. In 2013 Nancy earned a Master of Music degree in Composition with distinction from Westminster Choir College of Rider University, Princeton, New Jersey. In addition to the composition major, many courses were in the areas of Conducting and Sacred Music. 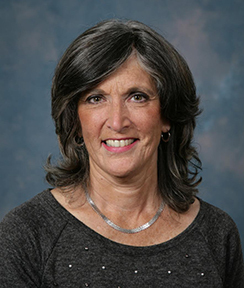 Nancy has taught music and directed choirs in southeastern Pennsylvania for thirty years and often visits local schools and churches as a guest composer/clinician. She composes on a commissioned basis and also writes for her choral groups. An active choral musician, she directs the Girl Choir at Our Lady of Mt. Carmel Church, Doylestown, Pennsylvania and sings in the alto section of the Academy Chorale and Chamber Society. A member of the American Society of Composers, Authors and Performers (ASCAP) in both composer and author categories, Nancy often composes original texts for her music. Passages from Scripture or from classical poetry (Robert Louis Stevenson, Mary Coleridge, Langston Hughes) are also her inspiration, and she chooses texts which seem to sing on their own. Nancy Gifford lives in Doylestown, Pennsylvania, where she composes and teaches piano in her home studio. She and her husband/patron John Humphreys have three grown children who have all sung in her choirs, two grandchildren, and a cat. She enjoys travel, reading historical fiction, family time, and watching the magical change of seasons in Bucks County, Pennsylvania. Nancy Gifford has 2 titles published with Santa Barbara.